At $90 a pop, this is probably the most expensive 9-inch birthday cake I’ve ever bought. And it’s not the first time I’ve bought it. 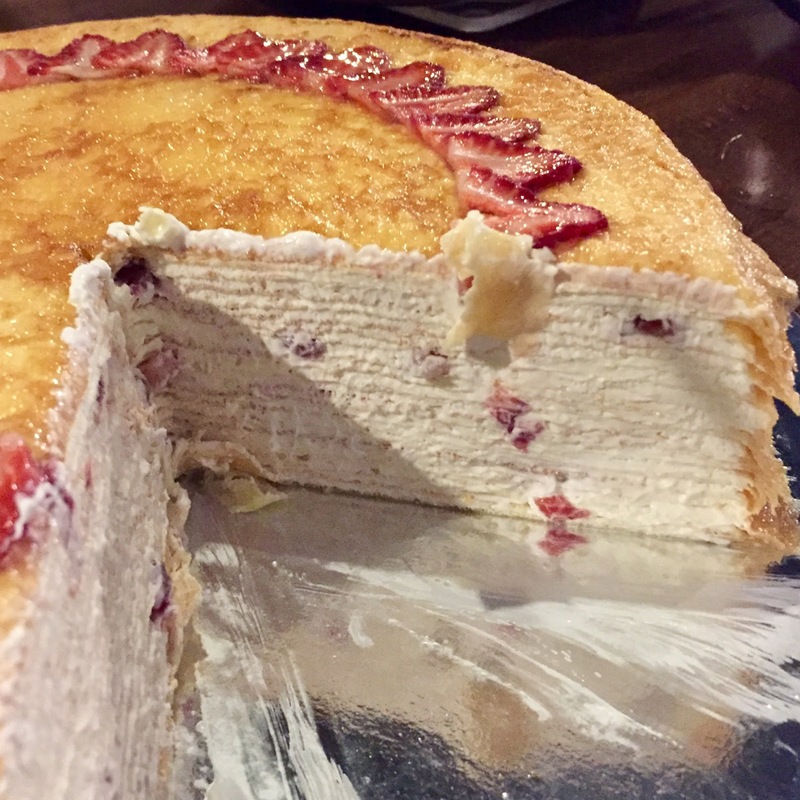 It’s from Lady M, which, to my knowledge, is the only bakery in these parts that offers such an item--a cake made up of at least twenty individual crepes layered on top of each other, one-by-one, whipped cream in between. 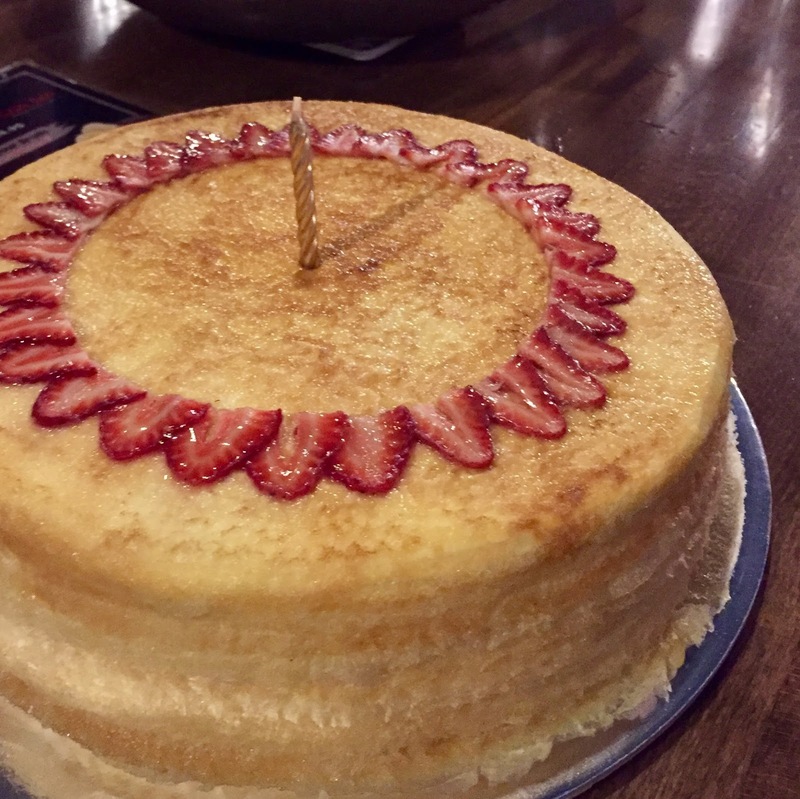 It’s a good cake, a unique cake, something I’ve written and raved about on this very blog; but every time I purchase one, I am reminded of how high and mighty Lady M is. As you may remember from my previous post, they call themselves not a cake bakery, but a “cake boutique”. Also they post a uniformed guard outside the door as though what they're selling was made of diamonds and gold instead of flour and sugar. But today, I found out that when you call the phone number, you’re not connected to the local store you think you’re calling but rather, a centralized call center. It was from speaking to the unusually formal-sounding phone representative--who I imagine is sequestered in an all-white room located in an all-white tower in Midtown Manhattan--that I found out they won’t write "Happy Birthday" on the cake for you unless you pre-order and pay at least two days in advance. "How much time do you need to scribble 'Happy Birthday' in colored frosting?" I thought to myself. Soon, I was transferred to the local branch to reserve the cake. And for the next few minutes, I spoke to an even more robotic woman whose factory setting seemed to be stuck on “insolent”. She told me that to reserve a cake (which I was going to pick up that same afternoon), I'd have to pay for it now, over the phone. She asked for my credit card, which was immediately charged the $90. When I got the receipt via text, it said that all sales are final. I point this out not because I am opposed to paying up front nor the fact that this is the only bakery I know of that insists on full payment for reservations; I point this out because it made me uneasy that they've now got all my credit card information scribbled on a random piece of paper. I was also told (not asked) to bring a photo ID when it came time to pick up the cake. When I went to the store to pick up the cake, I saw, for the first time, that the uniformed guard wasn't at the door. I walked up to the cashier, showed her my ID, and saw her pull out a three-ring binder in which my credit card information was written in pen. For a business that does not seem to trust its customers, Lady M seems to ask for a lot trust that that binder won't get into the wrong hands. Where's that guard when you need him? 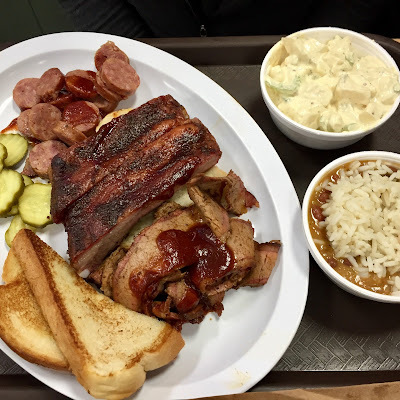 Is Joe’s Kansas City Bar-B-Que a restaurant in a gas station or a gas station with a restaurant? And is it in Kansas City, Kansas or Kansas City, Missouri--which are two separate towns that happen to be next to each other? And is it really in Anthony Bourdain's list of "13 Places To Eat Before You Die"? The answer these questions are "both", "Kansas", and "yes". And it's for all of these reasons, but mainly the last one that we made our pilgrimage. The pork ribs are divine, served with only its dry rub and so tender and uniform in texture it's almost ham. But the best thing I ate were the burnt ends, which is everything I like in BBQ distilled into intense single-bite cubes of charred melty fatty smoky meat. And need I mention that the BBQ here is dirt cheap? The Cowboy Special platter--consisting brisket, pork ribs, sliced sausage, two sides (potato salad and red-beans-and-rice), and Texas toast--costs $15.29. 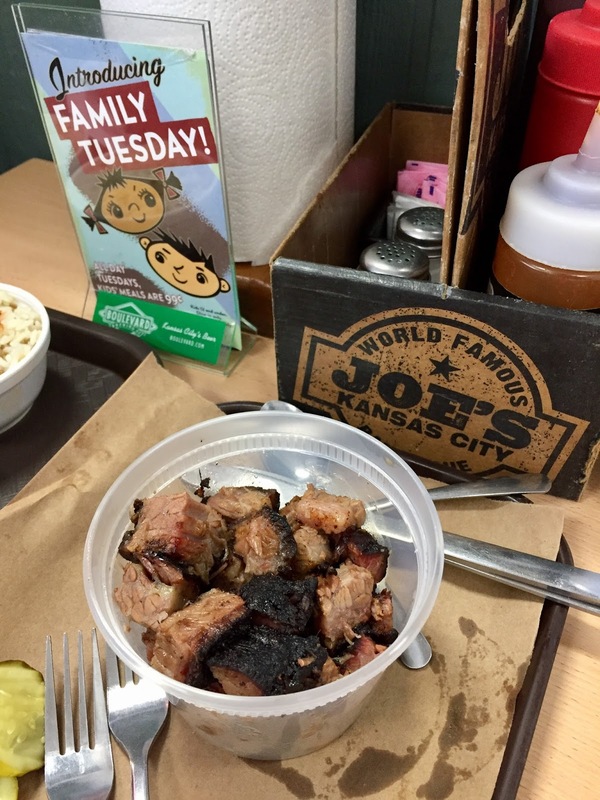 The half pound of burnt ends cost $9.25. It's almost appropriate that it's in a gas station, because it reminded me, in one nice package, of the two things that are way more expensive in California. As of this writing, gas in Kansas City is $2.50 per gallon. 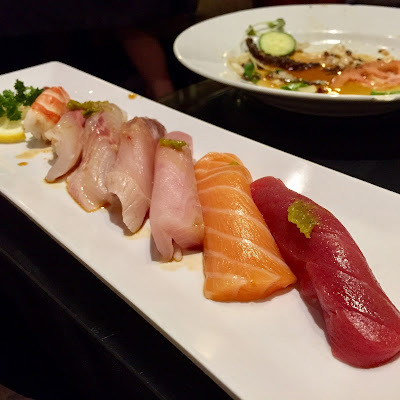 As this blog's purpose is to highlight great places to eat rather than tearing the bad ones just for giggles, I've decided not to name the sushi bar I'm reviewing here. But there should be plenty of clues to tell you which restaurant I'm talking about. Things started well. The ingeniously-placed mirrors in the waiting area, which is separated from the bar and the dining room, had the effect of disorienting me like I was in a carnival fun house. And then there was the professional appearance of the staff. The chefs wore blue kimono uniforms while the waitresses, red ones. Blonde wood slats surrounded the booths and the whole interior design evoked the rustic presence of a well-kept Japanese country inn. The place looked like another Honda-Ya, one of my favorite Japanese restaurants in Orange County. We began with something called "bonta", a sort of Scotch egg-like concoction. 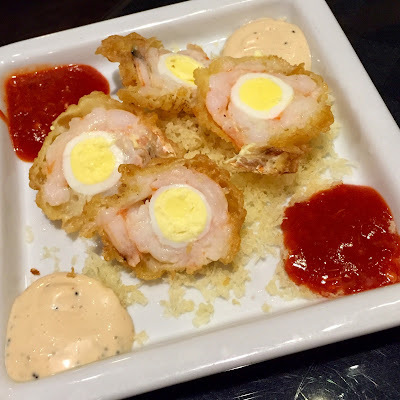 They were quail eggs encased in balls of shrimp, which were deep fried and served on a small hill of tempura crumbs. As I dipped them into its mayo and piquant red pepper sauce, I realized I liked them so much I told myself I need to come back and have more during Happy Hour, when it's discounted by half. Next, there was the salmon skin salad, a big portion of salmon skin scraps render to crispy in a toaster oven. They were piled in a big bowl of off-the-shelf salad greens with a few thinly sliced avocados. It was good, but I've had better. After that, things slowly slid from being merely mediocre to deeply disappointing. 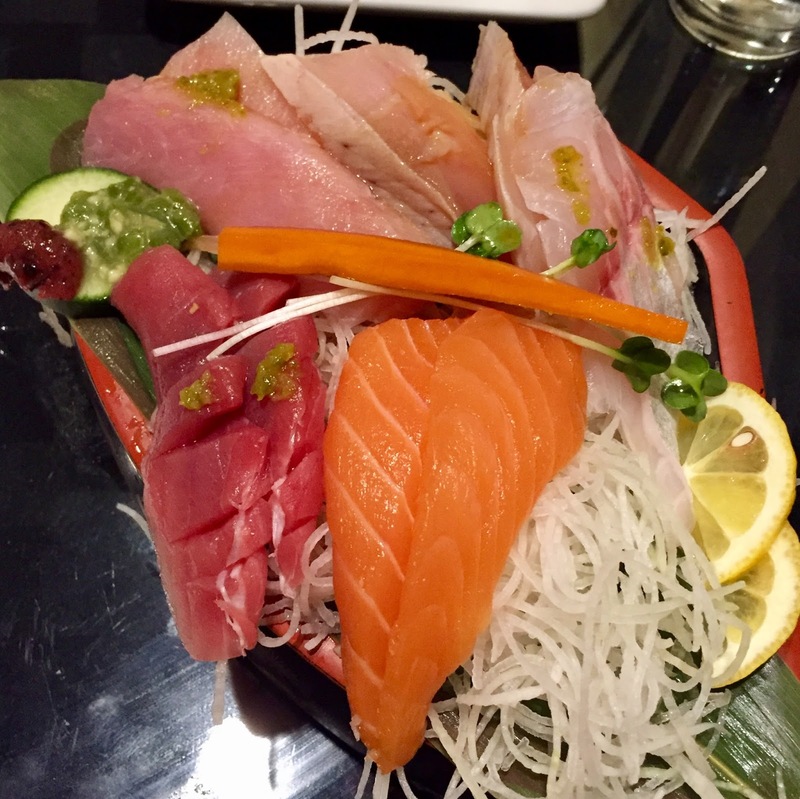 The sashimi platter--a standard assortment of salmon, ahi, hamachi, yellowtail and albacore--was sliced with no uniformity. Some parts were fat and others thin as carpaccio. The presentation was also lacking, looking as though it was just slapped together in haste and only slightly more appetizing than a Sea World chum bucket. Then the nigiri part of the omakase combo set came, which was the most disappointing of all. It was a repeat of the same roster of fish I had already eaten in the sashimi box, of which, at this point, I had already grown tired and bored. But the rice was barely there and what was present was gummy. Worse, the method in which the fish were cut was again haphazard and sloppy. Some pieces were ragged; some were as thick as slabs. And the flavor and consistency was on par with what I've had at those all-you-can-eat sushi emporiums, which isn't a compliment. Maybe I should've ordered the dinner combo with the cooked dishes. Maybe I should've stuck with the rolls, such as "Orange City" named after the burg in which this restaurant is located. Or maybe I should've known better that a place that dabbles in Groupons (which I used) and offered free ice cream with a Yelp check-in (which I did) would not and could not, in any way, measure up to the Sushi Noguchis and Nana Sans of the world. Maybe I won't be coming back for that Happy Hour after all. 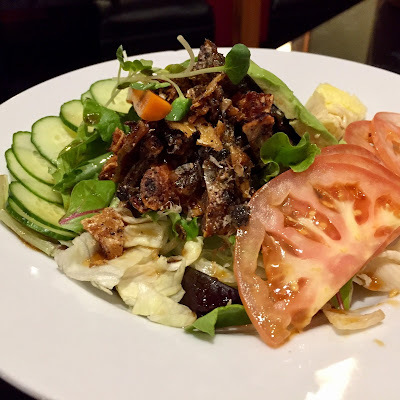 The last time I went to Maui, I consulted with none other than Kirk of mmm-yoso, the uber blog that has taught me everything I know about Hawaiian food, not to mention where to eat on every island in the chain. At the time, I printed out his recommendations on a slip of paper and stuck it inside the pages of the Maui Lonely Planet book I brought. On this trip, my second time, I took that same book and when I opened it, I rediscovered the piece of paper with Kirk's recommendations. 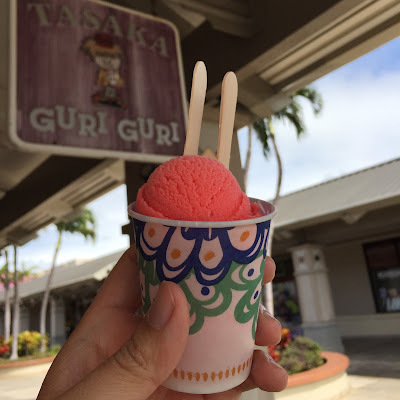 And just as I did then, I went to every place he recommended, which includes Sam Sato's, and this place, Tasaka Guri Guri, which is a treasure. I won't bore you with the details of what it is and tell you why you should go here if you're ever on Maui. Just read Kirk's blog post and you will convince yourself. Eating this poke bowl ($6.99) at Foodland Farms, a supermarket near Lahaina, made me happy. Happy that I discovered it by chance. Happy that it was so reasonably priced. Happy that it tasted fresh as though it swam just minutes before. Happy that it was well-marinated, with the seasoning seeped into the fish. Happy that it was one of the most satisfying and filling lunches I ate while I was on Maui. But it also made me feel sad. 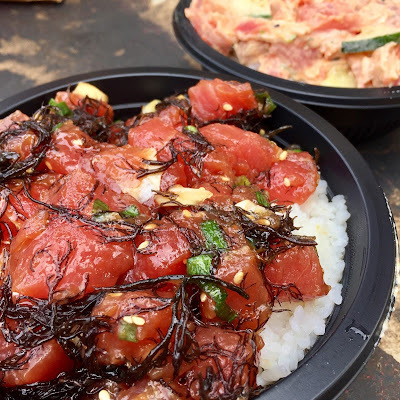 Sad that back home, in California, poke places continue to flood the market, but they're all those assembly-line joints that overprice and offer you the option to make barely-flavored or overly-sauced amalgamations that no Hawaiian would even consider calling poke. 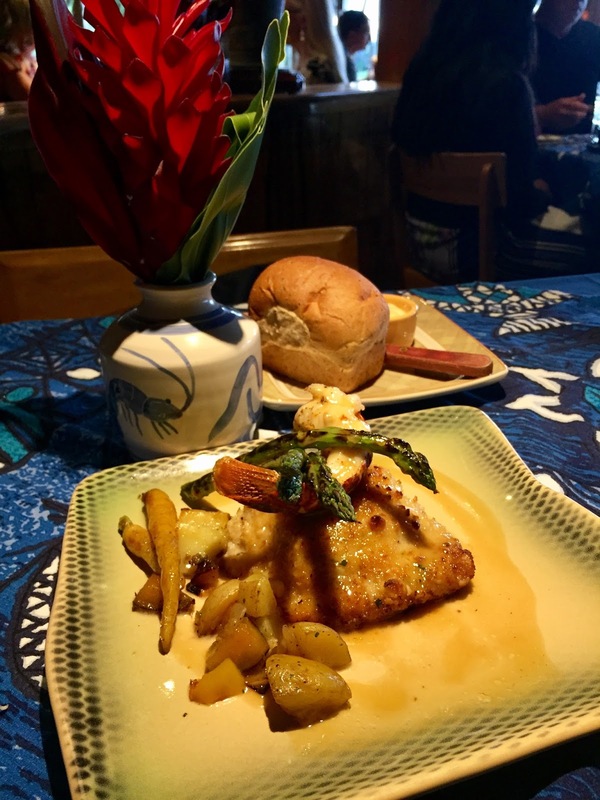 Sam Sato's is located in an industrial-looking area nowhere near the tourist centers of Maui. It is a place known to locals and those few out-of-towners who know of its existence. 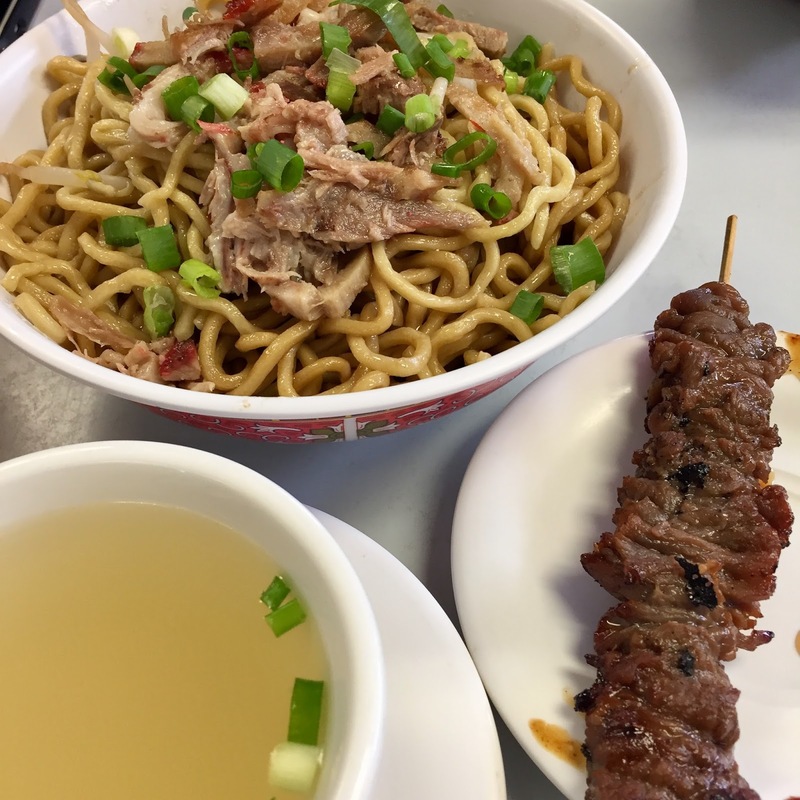 The specialty here is dry saimin--chewy, toothsome ramen-style noodles slicked in flavorful oil and topped with scraps of pork. It's eaten, or rather, slurped, with a side bowl of plain hot broth, and ideally accompanied by a beef BBQ stick, which is akin to something you get at a Filipino joint. The meal is filling, satisfying, and won't cost you more than $10 per person--it's the best food deal on Maui by miles. You might be tempted to label the place as Japanese because of the name, but it's not--it's Hawaiian, or more specifically, Mauian, a hyperlocal, hyper-good place that comes with no hype; just great, simple, reasonably priced food for those who know where to find it. Mama's Fish House has the most Yelp reviews of any restaurant on Maui (5,404 as of this writing), but don't let that deter you. It's that way for reason; It's that good. Besides, this place predates Yelp. I know because when I went there for the first time, it was before I blogged, and I, too, predated Yelp. I came back recently, and except for a few cosmetic upgrades, nothing much has changed at Mama's Fish House, including its popularity. So if you're planning a Maui trip, book it before you even secure your plane tickets. They're on Open Table, so it's easier now than before. And when you get here, plan on spending at least $40 to $50 per person. Maui is still the most expensive island, and this is probably the most expensive restaurant on that island--so do the math. But you do get what you pay for. The freshness and provenance of the fish comes with written proof: On the menu, most of the fish entrees has the name of the person who caught it, when, and on what vessel. This would be for naught if the fish wasn't cooked with respect and an expert touch--and it is. The picture you see above is their signature dish: the crab-stuffed, lobster-topped, and macadamia-crusted fish of the day. It melted like pudding in my mouth and was exactly one the main reasons we spent gobs of money to fly here and stay on this, the most expensive of all the Hawaiian Islands. Last year, in my OC Weekly review of Trade Food Hall in Irvine, I described Hiro Nori Craft Ramen as "soon-to-be-famous". It was new at the time, and I ate there the week it opened, but even then I realized how special it was. Not only was their signature tonkotsu ramen already fully realized--complete with thick and toothsome noodles akin to Kitakata that swam in a milky soup that's as rich but not as salty as Santoka--they also seem to have everything else figured out. Like a Swiss watch, all the pieces ticked in perfect coordination with each other. The service was efficient, but so was the kitchen. It was all I needed to see to justify the 15% tip they automatically add to the bill. I recently returned with friends who happen to be vegetarian. We all tried the vegan ramen. And I wouldn't have believed it if I didn't taste it myself, but I liked it even better than the pork. The broth is ultra savory, an umami concentrate. Only when I thought about it really hard and purposely swirled the soup in my mouth like a wine taster did I even notice it was meatless. For sure, there was miso in it, a splash of chili oil, and a stock that must have taken years to formulate; but the sum of its parts accumulated into one of the most satisfying ramen experience I've had in years. To be clear: This wasn't just a great bowl of vegan ramen; It was a great bowl of ramen. Period. The soy meat, roasted broccolini, creamy cubes of tofu, and that addictive chili paste they provide on the side was, at that point, all icing on a very well-crafted cake. It was also on the visit that I noticed what I saw that first week wasn't a fluke. Every aspect of the restaurant was still professionally-managed and completely thought through. To avoid cross-contamination and confusion, all the bowls are color-coded according to what broth filled them. Refills of water happened without me even noticing. And the reservation system makes sense and works with minimal fuss. I was most impressed when we got the bill. We asked if we could split it four ways with all different credit cards, the waiter hardly blinked when he said "of course! ", which, I don't have to tell you, speaks volumes.